Sant Kabir Nagar, Uttar Pradesh (UP) Lok Sabha Election Candidates 2014 Name, Results: Lok Sabha election in Uttar Pradesh (UP) will be held on 6 Phase while Country-wide elections will begin on 7 April and end on 12 May, 2014. The elections will be held in 9 phases. Uttar Pradesh (UP) has total 80 seats in Lok sabha Election 2014. 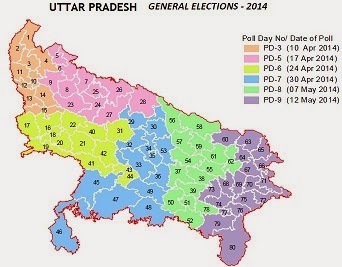 UP will begins voting on 10th April 2014 under Phase-3 (10th April) 10 seat, 11 Seats on Phase-5 (17th April), 12 seat on Phase-6 (24th April), 14 seat on Phase-7 (30th April), 15 seat on Phase-8 (7th May ), 18 seat on Phase-9 (12th May). The Election Results will be announced on 16th May 2014 for all 543 seats of country. Uttar Pradesh (UP) has close fight between Bhartiya Janata Party (BJP), SP and BSP while Indian National Congress (INC), RLD and AAP will play crucial role in Lok Sabha Election 2014. The Uttar Pradesh (UP) Lok Sabha Election 2014 Results will be announced on 16th May 2014, Morning.